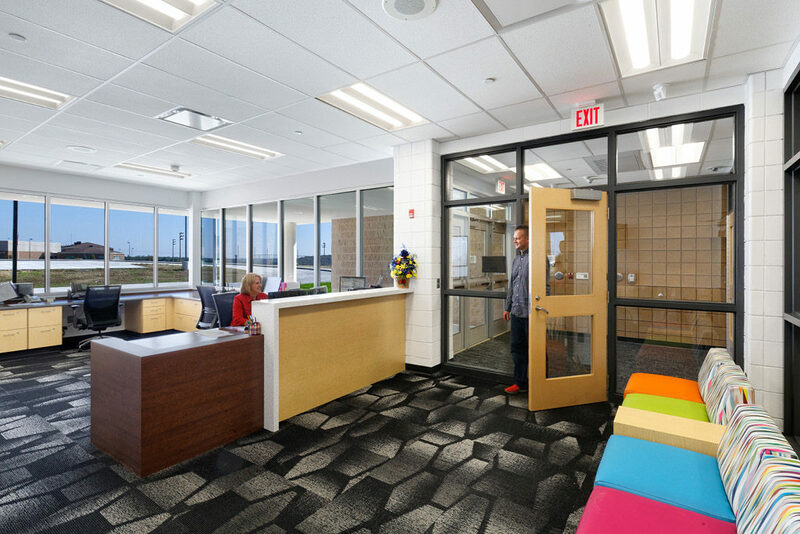 Security is top of mind for every school district in our country, and now more than ever, architects are making security a primary factor in their designs. As an architectural project manager who is certified in Crime Prevention Through Environmental Design (CPTED), these are the issues I think about every day as I explore new ways to make our students safe. One area of special concern is shared and community-use spaces, which have become more common in schools in recent years. These are places intended to have public access, generally during after-school hours or on weekends. Think gymnasiums, cafeterias, auditoriums, music classrooms, dining commons and kitchens. In some cases, outside groups rent these spaces when school is out of session, from church groups to sports leagues. And while the benefits of these spaces are obvious, they can present challenges when it comes to security. There are several key features that differentiate community-use spaces from the academic portions of a school, the primary being that they typically have limited supervision by the school’s staff when they’re being used as a shared area. Another is that they are often occupied by outside parties who may not be familiar with the space and know their surroundings. It is important that community-use spaces be separated from the academic portion of the campus. They should have a defined primary entrance, whether from the exterior or a common access point within the school that splits into distinct entrances for the shared space and the academic section. The shared spaces should have efficient mechanical systems that operate independently from the rest of the school. They should also have appropriate support spaces: restrooms, waiting area, concession, foyer, etc. The idea here is to prevent visitors from leaving the shared space to find the facilities they need. Wide open passageways without hiding places or concealed corners are needed to prevent someone from sneaking around the area undetected or hiding until the building is closed. There should be plenty of lines of sight so that everyone can see what’s going on throughout the community-use area, see all the occupants and be seen. A shared school space should have secure exits out of the building, but limit entry to one or two primary points. This helps ensure that everyone entering is observed, while still allowing ease of escape. Exterior doors should have security contactors, so if a door is held or propped open, the school’s staff or monitoring company will be alerted. Interior doors should have the ability to be locked off to prevent visitors from wandering where they shouldn’t, or to cut off an attacker. Glass and security cameras at West Muskingum Elementary School allow everyone approaching and entering the building to be observed. After check-in with staff, they are directed where in the building to go. Exterior landscaping and sidewalks should be designed to guide people directly from the parking lot to the entry point. Landscaping should not create hiding spaces or prevent observation of approaching visitors. Community-use spaces should have lots of wayfinding signage to direct visitors who may not be familiar with where to go, how to find bathrooms, concessions, exit points, etc. It is also vital to have emergency contact information and alarms throughout the area so people can instantly call for help if there’s an emergency. In order for a school’s shared spaces to be as secure as possible, these goals should be discussed early in the planning and design process. 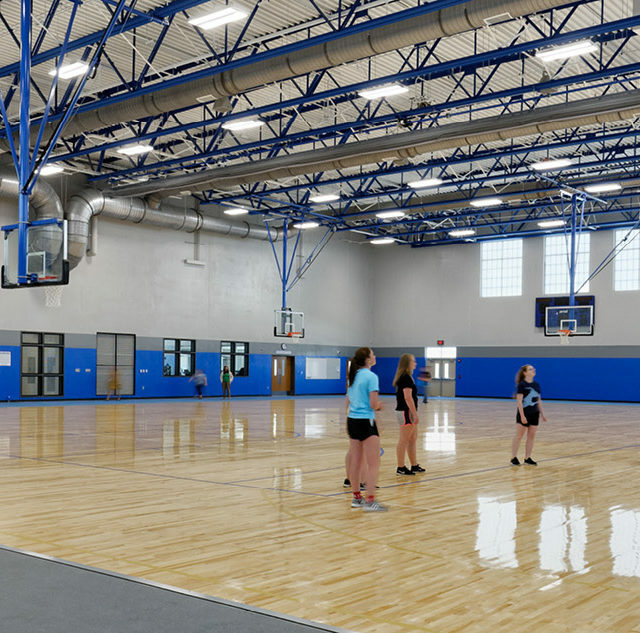 By working collaboratively with school designers, school districts can offer their facilities as a community resource while still ensuring the safety of all.